The continent of Africa is the source of humankind and the original human was "black" in the sense that we understand "black" today. In pre-historic times when the continent was populated by Pygmies and Khoisids. As I have demonstrated several times in this and other threads, North Africa has had Eurasian back migrations for at least 50,000 years. What is more, according even to afro-centrists, Africans in north Africa were already evolving towards a more Caucasian look since North Africa is on the same latitude at the Middle east. See the bottom of the post. All of Africa, including Egypt was black. already demonstrated multiple times to be incorrect. Simply stating it over and over does not make it so. During the time of Cleopatra, the pharaohs and queens where "different" than the Ethiopian pharaohs before them, but all leaders had to prove lineage to Ethiopia (and therefore to the source - the "black"). This is absolute fantasy gibberish. Cleopatra was from a Greek dynasty, but even before Egypt was conquered, they referred to Ethiopia as "miserable Kush." I have never heard Afrocentrism quite so garbled and misguided as this. Before Egypt was called "Egypt" the European/Greek name for the entire region of Africa was Ethiops or "black land" and no it wasn't because of the color of the mud, it was because of the people (see J.A. Rogers - the leading authority on pre-dynastic Egypt). It was because of the land. The fertile lands were called KMT, or "black lands," and the interfile lands were called DSHRT or "red lands." It is from this that we get the word "desert." Whoever this J.A rogers guy is he is an idiot. No he did not. He referred to them as "Melanchroes." This was a word that Greeks used to describe swarthy members of their own race. In The Odyssey, Odysseus is described as "Melanchroes." because it was known and accepted at that time that Egypt was a colony of Ethiopia. There was a myth, which is not to be taken any more seriously than Romans saying that they are Troy, or any other myth. Modern science tells us that influences on Egyptians came from all directions. Everyone on the African continent today knows that. Most people in Africa could not find Egypt on a map and could care less about Afrocentric nonsense. The refusal to accept this historical fact is understandable in light of the falsification of history that has and continues to take place in western civilizations. Grow up - your refusal to accept these facts only highlights your insecurity. Chest thumping and false certainty are typical Afrocentric tactics. They impress no one. Usually there are emoticons and giffs involved. Before there was Europe there was Africa. Actually, we have a fine thread going on Vinca civilization in Europe which pre-dated anything in Africa. Oldest proto-writing in the world, two story buildings, agriculture, more advanced pottery for the time than the Nile Valley, and some of the oldest copper work. You should look at the thread and educate yourself. European civilization is the product of Africa, especially early Greek civilization. It is what it is. Absolute gibberish. Greek civilization learned more from the East, and went on to invent things unheard of in Egypt. You are talking about the nonsense "Black Athena" nonsense, for which there is not a shred of evidence. Egypt was never "black." I have literally dozens more pieces of scientific evidence but this will suffice. Thus, we propose that the Neolithic transitionin this part of the world was accompanied by demic diffusion ofAfro-Asiatic–speaking pastoralists from the Middle East. suggested a West Asian origin for theautochthonous North African lineage U6.
) may have been carried to Africa by anAsia-to-Africa back migration in prehistoric times. did any of the mummies ever have afro hair? 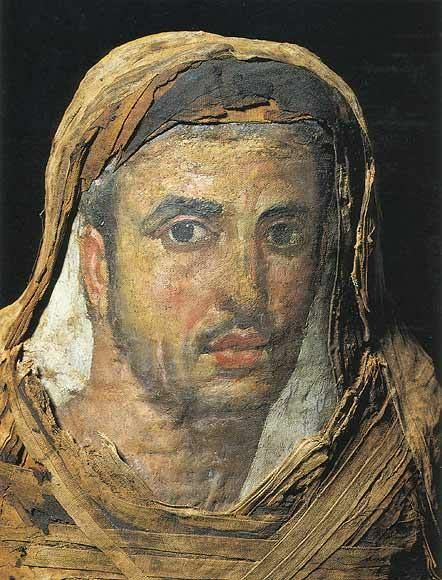 Check out this large collection of Fayoum mummy portraits from Egypt: Pinterest These are photo-realistic images of the actual people, painted at the time of their life/death. Here you have "pictures", and the dna tells the rest of the story. These are realistic portraits of common Egyptian residents showing genetic phenotype. If someone showed me these images off the street and I had no idea where they were from, I would swear it was Greece or Rome. My guess is that they were mostly mutts, like most humans. Dna tells us the true story when looking at individual people; in Cleopatra's case, she was Greek - end of story. Last edited by L0ve; 08-03-2014 at 11:14 AM..
Cleopatra wasn't 100% Greek in ancestry. I think I already explained that somewhere on this thread. As to your "so called" photo realistic images, you have to keep in mind that just going by skin color and stereotypical phenotype features doesn't mean you know what a person's ancestry is. It is also important to know that there is no single skin tone or facial feature among African people. It can vary depending on the region and ethnic group. So trying to apply Eurocentric racial ideologies of "Blackness" to Ancient Africa is just plain stupid. Cleopatra wasn't 100% Greek in ancestry. I think I already explained that somewhere on this thread. Correct. She also had small amounts of Persian. There is no evidence for anything else. As to your "so called" photo realistic images, you have to keep in mind that just going by skin color and stereotypical phenotype features doesn't mean you know what a person's ancestry is. It is also important to know that there is no single skin tone or facial feature among African people. It can vary depending on the region and ethnic group. So trying to apply Eurocentric racial ideologies of "Blackness" to Ancient Africa is just plain stupid. A fancy way of saying that there are people who evolved in Africa who looked Caucasian, which we all know. It is basically all of North Africa. But "Black" is a phenotype and if they look more Caucasian, then they look more Caucasian. All of which is irrelevant, because Cleopatra had no African blood that anyone knows about. Please keep in mind, I have already debunked that silly article about the skull which might or might not be from her half sister. I would be happy to do so again if you want to get into it. I'm actually shocked you didn't say Cleopatra had blond hair and blue eyes. As to your "so called" photo realistic images, you have to keep in mind that just going by skin color and stereotypical phenotype features doesn't mean you know what a person's ancestry is. Did I make up these authentic photo-realistic images myself? No. These are actual images of the Egyptian people from the period. They clearly had a mix of European, Indian and African blood via phenotypes. Are you saying that if they all had platinum blonde hair and blue eyes, it would not matter either, since phenotypes mean nothing? Differences in features do exist and there is nothing wrong with pointing them out. The rest of my point is that Cleopatra had scientific DNA genetic profiles done and she is clearly almost entirely Greek with no African blood. That is reality and truth. As I said, most of them were probably mutts like you and I - then you accuse me of applying "Eurocentric racial ideologies to Africans"????? I'm not sure what you are trying to argue here unless you are saying the "so called" images are fake, her DNA profile is a fake, and phenotypes tell us absolutely nothing??????????????????????? All I'm saying is that in general it is not good to get so caught up in skin tones and phenotypes and then base someone's racial identity off of it. This is especially true with African people, who can vary differently in appearance. Just because those ancient Egyptians in those pics posted don't look like what you perceive "as a true African" doesn't automatically mean they're mixed with non-African ancestry. Have you ever thought that "just maybe, it is possible that African people can look like that without having any mixed ancestry? The continent of Africa is the source of humankind and the original human was "black" in the sense that we understand "black" today. All of Africa, including Egypt was black. During the time of Cleopatra, the pharaohs and queens where "different" than the Ethiopian pharaohs before them, but all leaders had to prove lineage to Ethiopia (and therefore to the source - the "black"). Before Egypt was called "Egypt" the European/Greek name for the entire region of Africa was Ethiops or "black land" and no it wasn't because of the color of the mud, it was because of the people (see J.A. Rogers - the leading authority on pre-dynastic Egypt). Even Herodotus referred to the Egyptians as "black" people because it was known and accepted at that time that Egypt was a colony of Ethiopia. Everyone on the African continent today knows that. The colony eventually became more militarily powerful than the source (same as Great Britain and the U.S.) The refusal to accept this historical fact is understandable in light of the falsification of history that has and continues to take place in western civilizations. Grow up - your refusal to accept these facts only highlights your insecurity. Before there was Europe there was Africa. European civilization is the product of Africa, especially early Greek civilization. It is what it is. If "black land" does not refer to the soil (or mud, a you call it), why did ancient Egyptians reference to themselves as "people of the black land?" It is a shame that your first post is full of ignorance and misinformation. Well, I am here to talk about the Greek Cleopatra, based on the title of the thread. Egypt has been filled with Greeks since ancient times, and to me, many of their pictures appear very Greek. You need to look to sub-Saharan Africa if you want to focus on Africans with no "non-African" ancestry. Egyptians do not consider themselves as African. My best friend I grew up with is married to an Egyptian who immigrated here. The sub-Saharan region is considered to be inhabited by "Africans", while the north is considered Middle Eastern, Mediterranean, and Islamic. Like I said, they are mutts like the rest of us. I really don't understand what the argument is here. I was simply posting actual images of the people who have a strong Greek influence genetically - it is not "basing racial stereotypes off skin tones." Egypt is not southern Africa anymore than the US is Mexico. Different regions, different genes, same land mass.